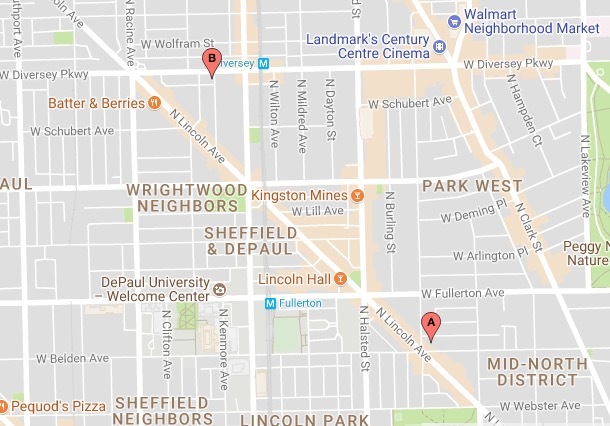 Four people fell victim to an armed robbery crew in Lincoln Park early Friday morning. One victim was pistol-whipped by the offenders, police said. The robberies are believed to be connected, and no one is in custody, according to a police source who requested anonymity. Around 12:50 a.m., two men—ages 21 and 22—were walking in the 600 block of West Belden when a gray or silver BMW X5 pulled up and multiple offenders jumped out. The robbers produced a handgun and announced a robbery, taking the victims’ cell phones and wallets before getting back into the car and driving away, according to police. Five minutes later, a 23-year-old woman and a 24-year-old man were walking in the 2700 block of North Kenmore when several occupants jumped out of a vehicle, pointed a handgun at them, and demanded their property. The male victim was also pistol-whipped, police said. The woman surrendered her purse and cell phone to the offenders who returned to their car and drove away. She was not injured. The male victim refused medical attention. Police later recovered the woman’s phone in a yard near Diversey and Lakewood. A wallet taken during the first robbery was recovered at Diversey and Kenmore. Police described the offenders only as four black males in their 20's riding in a gray or silver BMW X5.